Assistant referee Steven Craven has said that he and Dougie McDonald lied to Neil Lennon over an incident in the Dundee United v Celtic match. Steven Craven has revealed that he agreed to lie to Celtic manager Neil Lennon about a penalty incident at Tannadice two weeks ago. Craven resigned following the controversial decision and though the SFA cleared match referee Dougie McDonald of any wrongdoing they did warn him about inconsistencies in his match report. McDonald had awarded Celtic a penalty during the game on October 17 but, following a discussion with assistant Craven, reversed his decision. Celtic manager Lennon was furious with the decision and Craven has told a newspaper that he and McDonald lied in the aftermath. “Dougie ran towards me and said: 'I think I've f***** up. ',” Craven told the Sunday Mail. “After the game Dougie said we should tell the referee supervisor (Jim McBurnie) that I called him over to question the penalty award. "I went along with it because I wanted to be supportive of Dougie. But then Neil Lennon came in after the game and asked Dougie why he hadn't given the penalty kick. 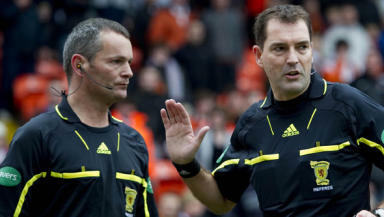 The linesman also accused the SFA, and in particular referees’ chief Hugh Dallas, of “harassment and bullying”. Dallas claimed after the match that Craven had told McDonald of his mistake but the SFA inquiry revealed that McDonald had realised his own error and subsequently spoken to his assistant. Craven says Dallas was reluctant to accept that version of events and said the former FIFA listed referee’s attitude had other referees considering their future. "Morale is low, rock bottom in fact," he told the newspaper. "But it is down to the pressure being put on some officials by Dallas. "I'd had enough of Hugh Dallas and John Fleming. For a while I felt I had been the victim of harassment and bullying from them. "Hugh has changed some things for the better, but I just wish he'd stop treating the officials like children. A lot of guys are not happy with it and are ready to walk away." The SFA has accepted Craven’s resignation for the professional game but the official says he intends to continue refereeing at an amateur level.